It's not very often that I try a new foundation. Forever a die-hard Estee Lauder Double Wear fan, it's hard for me to even consider trying something else, as it's pretty much guaranteed I will always go back to good old Double Wear. If you've been following me for a while you'll know I love a full coverage, matte finish, which DW delivers every time. However, after falling in love with Revolution's Conceal & Define concealer, I just had to see how the foundation version compared. The Revolution Conceal & Define foundation was released last year and there was SO much buzz around this product. As with the concealer, beauty vloggers were filming positive reviews for this product in their droves, and with 50 different shades to choose from, I had to give it a go. The foundation basically looks like a bigger, chunkier version of the concealer, and even comes with a similar-styled applicator (something I'm not used to with a foundation, but actually makes getting product out of the bottle a bit easier). The shades work in the same way as the concealer shades, with each shade tailored to a different skin-tone (light/fair/medium/dark/deep) and undertone (yellow, pink, neutral). It means you should be able to find a perfect (if not pretty decent) colour match. I picked a few different shades - one for when I'm tanned and one for when I'm not - and both blend with my skin tone pretty well. Upon application the foundation definitely seems thinner in consistency to Double Wear, but it does build up to a really good coverage without much product being used. It's definitely a matte, full-coverage finish, which doesn't look too dissimilar to how Double Wear does once applied. I did find it a tad trickier to blend, however, particularly around my nose. I also found, particularly with the paler shade (no idea why!) that it would start to go patchy around my nose and transfer really easily - I'd touch the skin on my face and find foundation on my fingers, which isn't ideal. However, I think for the £9 price tag, this is a really good foundation and it's no wonder it's had so many rave reviews. It's full-coverage, affordable, comes in an endless range of shades and leaves your skin looking pretty flawless. I'm yet to try the foundation with a primer so this could be the answer to my patchy nose problems, but other than that I really can't fault it. 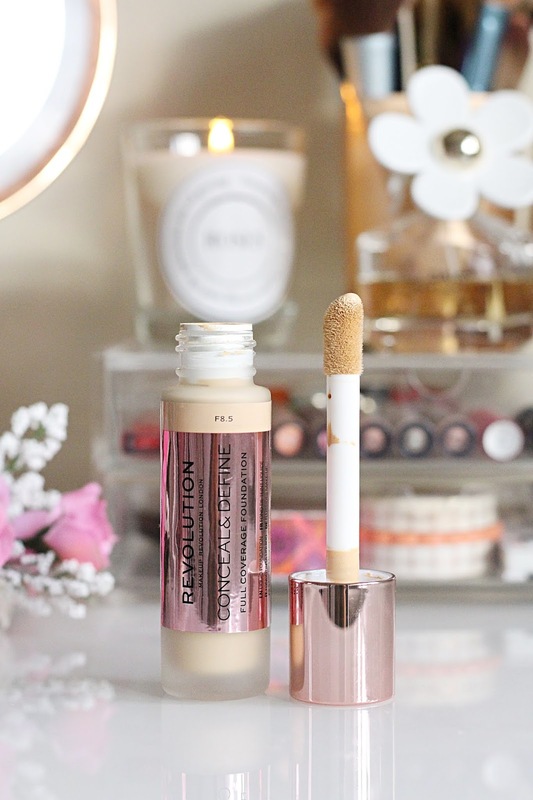 Have you tried Revolution's Conceal & Define foundation? I'd love to hear what you think to it!